Hamptons is one of those styles that just never dates. It’s loved by young and old – and all different tastes. The beauty of the ‘Hamptons’ look is that it can be used very subtly, or applied to an entire room or home. We are sharing our top tips to bring the relaxed-yet-sophisticated Hamptons style into your home in five simple steps. The first thing to be considered when taking on the Hamptons look is your colour palette. When you think of a Hamptons interior, what do you see? The colours used are cool tones, weathered naturals, and lots of white. So create that neutral colour palette with off-white walls, perhaps some off-white panelling, and timber floors either in a very dark brown or a pale, bleached tone. Hamptons-style furniture is durable, practical and natural. It’s not embellished pieces or intricate designs. Opt for simple and practical, with a sense of organic. Perfect choices are linen upholstery, wicker and rattan. You can also consider built-in furniture, like a window seat or bookshelves, to make the space feel even more simple and streamlined. Again, neutral-coloured decor pieces that tie in with other pieces in the room are key to this look. Think about just one ‘wow’ piece in each space. Beach-style pendant lights or lamps work well, with shell details or wood or ceramic beads. Finally, give some new life to your existing decor or furniture pieces, or scout some vintage stores for rustic accessories. The Hamptons home has a ‘lived in’ feel that instantly creates a sense of being at home. He is one of the world’s most-loved entertainers, but he keeps his private life just that: private. So we’re more than a little excited to catch a glimpse inside Ricky Martin’s new Beverly Hills home. The pop star moved into the 3,000-square-foot home with his fiancé Jwan Yosef and their nine-year-old twins Matteo and Valentino just a few weeks ago. Worth $13.5M, the seven-bedroom mansion feels warm, private and creative with strong mid-century influences. That’s no surprise, as the home was designed by acclaimed architect Gregory Ain in 1953. Working with Nate Berkus on the interiors, the couple’s priorities were comfort and practicality. With their sons growing up ‘on the road’, the move into this home marks a change in pace for the family. A few stand-out pieces are the custom concrete table by James de Wulf in the dining room, the leather daybed by BassamFellows, the artwork by Kerry Skarbakka that hangs above the bed and copper pendants that bookmark it by the legendary Tom Dixon. Images by Architectural Digest from here. ‘Serene’ is the word that comes to mind when looking inside the $6.6 million Beverly Hills home recently purchased by Serena Williams – how fitting is that?! The internationally-famous tennis star, along with fiancé Alexis Ohanian, put their Bel Air home on the market late last year. It didn’t take long for the couple, and their baby daughter, to find their new dream home: a five-bedroom, seven-bathroom Spanish revival style mansion. Sitting behind an exclusive gated community, the three-storey home is contemporary and bright, with Mediterranean references and was built in 2017. 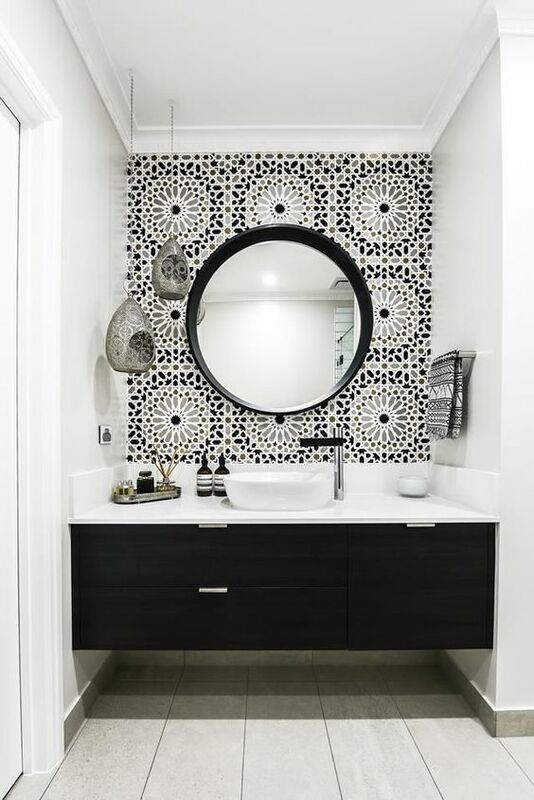 Interior designer Sharon Taftian was responsible for the interiors, introducing Moroccan tiles, unlacquered brass finishes, brushed-oak hardwood floors, and a Moroccan-esque rug in the main bathroom. The kitchen features warm-toned cabinetry, which is a trend we’re seeing in interiors this year, while throughout we can see the focus on soft lines and plush furnishings – another popular trend in interior design. Outside, the home features a layered garden and an open air pool complete with a swim-up bar that we have no doubt the tennis pro will enjoy after her gruelling training sessions, along with the yoga and massage room! Images: DustyLu Photography and Nest Seekers International from here.